This scoop-neck tweed jacket features metallic accents and a hook-and-eye closure. 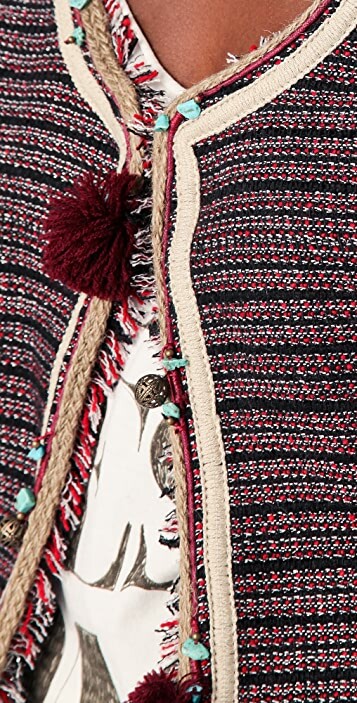 Twine and fringe trim, pom-poms, and beads at neckline and at cuffs. Welt hip pockets and padded shoulders. Long sleeves. Lined. * Shell: 73% polyester/16% wool/8% acrylic/1% nylon/1% viscose/1% other fibers. * Sleeve lining: 50% polyester/50% viscose. Very disappointed, the fabric looks cheap and the fit is off. Definitely does not worth the price. Sadly returned. I love unique style of Maison Scotch, and the delicacy of this design is so cool. Jacket fits perfectly - very happy with the purchase!